Recently, a business associate wrote an article (directed towards Virtual Assistants), calling in question the pattern of VA’s that follow the fake it until you make it mindset. I believe a multitude of unseasoned VA’s believe they can offer services they aren’t familiar with, with the thought that they can learn what they need to learn after they are hired to complete the job. Where does this thought pattern come from? Through social media channels, these “newbies” are told by colleagues that learning particular tasks is easy-peasy. Sadly, this puts a sour taste in the mouth of those that have hired a virtual assistant only to later find out the VA lacks in experience and skills. Honestly is always the best policy…if you have SOME experience, tell your client exactly what you know. Tell your client that you need to do some research, and tell them why. Be transparent. Do this as a service to the entire VA community! 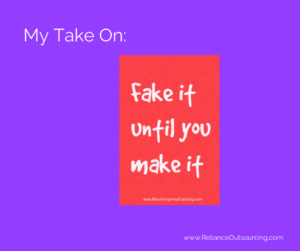 I’ve written about Fake It Until You Make It on several of my blogs, here and here. As a small business advocate, a soldier for entrepreneurs and fresh-out-of-the-starting-gate solopreneurs, my “Fake It Until You Make It” thoughts focus on the mindset of you are what you think. Think it and you will be it. Don’t listen to the doubting lies in your head, or the loving “suggestions” from family members who don’t understand what you do (for a living), instead, focus on the “I am…”. I am capable. I am worthy of change. I am able to start a business. I am succeeding at business. I am learning. I am being the best that I can be. I am loved. I am supported. I am making a difference in the world. I am doing what I was created to do, and I am doing it well. Sit up straight, lift your chin, pay attention to your breathing, release any physical or mental signs of stress, and simply believe. Believe in “I am.” And…until you loosen all doubt from your mind, if any remnants of doubt remain, fake it until you make it – don’t give up. Failure is only for those that quit. Honesty is the best policy in business. You, the business owner, are the expert (in what you offer). Never offer what you don’t know. Be who you are. Develop the mindset of “I am,” and yes, if you have any doubts, you can fake it until you make it. You can do whatever you set your mind to. Just don’t offer services that you know nothing about! There’s a thing called learning and professional and personal development…an entirely different topic!